← What’s Happened to Mother? 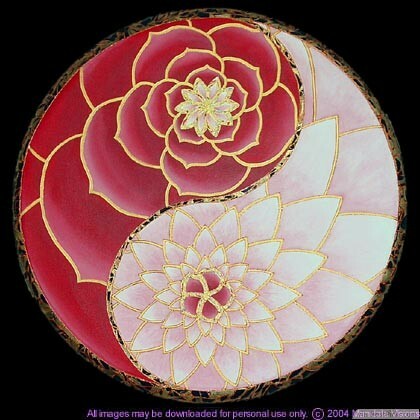 While the Yin/Yang symbol seems a great representation of the forces of duality, it implies a third and equal force, and that is flow or movement arising from the relationship of the two. We are in relationship with self, other human beings, other cultures, other human families, the natural world, the world beyond physical form, the Universe, the Creator Force – in relationship with creation. Let’s consider the relationship flow: active, passive, result or give-receive-outcome. It could switch to receive-give-outcome, or outcome-receive-give and so on. That’s the way I see it anyway, from the perspective that is Ida. I also see it as masculine, feminine and child; mind, heart, and their expression: all of the different ways we have of viewing that Trinity. Unity consciousness begins within myself as I bring the Trinity into balance. It extends out from there into every relationship. Love of creation, and care for the physical world is within human nature – it is in all of us. We’re bringing the feminine, the heart, the intelligence of feeling, the inner teacher, the white dot within the dark space, also known as Spirit, back from a time period when it has been suppressed and devalued. I just enjoyed a conversation with my 30-year-old son that was more revealing than usual. I really was able to see that his memory of experiences, in the same place at the same time, while trekking right beside me, is so different from what I saw, what I felt, what I experienced. It was deep. We are truly unique, every individual has a viewpoint, every grouping of individuals, from family to human family, has a viewpoint. When I think back to the time period we were discussing, I remember it as a continuous, determined ‘mountain climb’, good times but often stressful, focused on survival… both physical and spiritual. My son’s memories put him in a much different world: he knew the underside of Chicago’s west side, and I had no idea: two worlds. We talked about his dad, my late husband. He recalled that his dad was never armed with a gun, and yet he seemed fearless. He would confront a thief, or someone he had to correct, in a second. People didn’t challenge him or ever pull a gun on him. He was a force for good and the neighborhood respected him: a warrior soul. I shared nearly three decades with him in his world, which is so different from mine: a difference both in the way an experience is received internally and in the conclusions drawn from that observation. It’s the same difference I saw with my son. How do we rise to unity consciousness when we are so different? Relationships can be healed. We can communicate in ways that heal when we speak from a balanced position of mind and heart, and get to know one another in openness: that’s a good start. We are deeply conditioned with fear and false impressions, so this is a learning process, and it requires courage and staying power. Many have started by questioning their purpose – who am I, and what am I here for? My answer to that question today is: I came to fulfill the prayers of my ancestors, to liberate them from the burden of a judging God by liberating myself. I haven’t always looked at it this way, but it seems a good answer, one of the answers at least. We embody our family line for a brief lifetime, and during the ride, which is real, we are the family line. The body carries its own intelligence, and it likely includes more of our ancestors’ experience than we realize. We are born in a physical form full of information – our place in the story – each story unique. Will unity consciousness be achieved when we get rid of differences by encouraging intermarriage of races, eliminating gender, mixing all the religions into one spiritual belief and so on? This cultural push has been going on since I was a young woman, presented as a greater good, attached to the liberation of the feminine. People authentically want a kinder more caring world, but that desire can be and is manipulated, and taken to the extreme. Excessive empathy is not the way to unity. To be so empathetic toward victims that you lose your sense isn’t natural – it’s born of social conditioning. Forced empathy is experienced by many as tyranny… and it is. The heart is not a tyrant over the mind. Heart receives light from the mind, and mind receives direction and inspiration from heart. As we now create new patterns of behavior and relationship we must remember to carry forward the valuable old patterns. We get balance from this. From a balanced position both ancestors and descendants are embraced within us – that’s a place to stand and heal. Family and Families: we don’t need to change the foundation – give attention to the programming your children are subjected to. Culture: it sustains and maintains health and life of a people – beautiful and beneficial when arising from the feminine aspect and not manipulated via marketing. Separation or integration: an individual choice based upon the need for healing and creating. Eliminating gender identity: our empathy is being manipulated on this one – wake up. Male and female are inherent to family, which is the foundation of life. How about religion? One Divinity is a natural – we will all come to that: but not one religion. Cultures and peoples have their own ways and means of understanding that God is within the human core and we are One Human Family, experiencing One Love. I am the mother of mixed race children, and this was a personal choice, right for me and for my husband and children, and right for my life path. That said, as you can see, I do not jump on the integration bandwagon. Black people whose ancestors were forcibly brought here can choose to live separately from us if they wish: it’s not a rejection of us nor is it an accusation. Separation can be needed for healing and I’m in the healing corner. We’re here for that purpose, and we will find our way to love one another without being subjected to what the system deems as a ‘correct’ viewpoint. I love black people and I have looked closely and experienced through relationship the impact of their collective experience – a people who have survived trans-generational physical enslavement. Think about it… what strength did a mother have to call upon, giving birth to a child that she knew would be brutalized in front of her or sold to someone to never be seen again. How incredibly tried and tested is her Spirit… her faith. She prayed for God to come with every cell of her being and when it appeared that God did not exist, she carried on. She is now her descendants, and they are tasked with answering her prayer and creating heaven. The ‘clay feet’ of the US is the forced assimilation and genocide of Native Americans and the enslavement, ethnocide and forced assimilation of Africans. That is the simple truth and – natural for some. Is there something wrong with white European-descended people collectively, for which we should be experiencing collective guilt? From our history one might want to claim some guilt, but no: you and I, we didn’t do the deed. But… we did choose our place in this story: some can even remember making the choice. Point being; this is the Soul’s journey. The body is the vehicle – and – the story. Most of us truly would like to balance the scales of justice now, as we step out of the system’s program. I am my ancestors, accountable to my descendants and the future world, so the responsibility for learning, healing, and bringing this story to a beautiful and just conclusion is felt. When the US Government granted land to Europeans, my ancestors saw opportunity. They left home and family and claimed what was offered in the hope of a better life. As a consequence, the way of life of the Native Americans was utterly destroyed. They were rounded up; hated, feared and killed. This is a relationship that remains out of balance and must be healed as we expand in awareness. Our relationship with Black people, in particular Afrodescendants who have survived slavery, is seriously out of balance to the degree that we hear talk of race war. I’m not one who can ignore this. Learn about the ‘other’: not from what is placed in front of you by the popular media, read some of their scholars and historians. Listen to them as I listened to my son, with the utmost regard for their experience and their perspective. We’ve been enjoying Afrodescendant and Native contributions to American life for a long time but have we listened to their story as they see it? Now it’s time to look into history and listen, and see our different worlds. Turning again to the Yin/Yang symbol, visualize the white dot in the dark side as larger – the receptive side has become more active. The black dot in the white side has also become larger – the active side is more receptive. Humanity’s experience over these thousands of years has led to change – it has transformed the woman and enlightened the man: she has increased in mind or ‘active’, he has increased in heart or ‘receptive’. Human nature is divine – set free, balanced and heart-based we can heal and create heaven. We can make it through the leap in human consciousness that we’re feeling and experiencing now. We can make it through the karmic return or the zero point or the light shining into the hidden. We can make it through the weirdness that time has become, and the fear that permeates the collective consciousness. Many people are now beginning to see that there is something very wrong with the administrators of this world, some of whom are born of ancestral lines that have ruled over the masses for centuries. The foundation of their system, which has controlled us for oh so long, is a ‘compete for survival’ program. Spiritual seekers are breaking free from that, and it’s a huge step. Coming to know the ‘other’ is pretty much a requirement.